This is the first in our series devoted to the unsung genius of Nicholas Ludford. This once shadowy composer has now been brought into the limelight through the research work of Dr David Skinner and a set of four discs of his music. 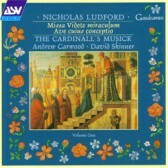 The Missa Videte miraculum is unusual in being scored for two treble voices, giving the piece an exuberance and brilliance which sets Ludford apart from his contemporaries. The Mass is set within the context of plainsong for the Feast of the Purification, and the disc is completed by Ludford’s setting of the popular text Ave cujus conceptio.